We made a mistake and told too many people about a situation we meant to keep a bit more “secret” for a while. It’s probably not a big deal, but we should have mentioned to those people not to go crazy until we had more information. If you don’t know what I’m talking about, ignore this. If you do, shame on you for not reading our minds! Seriously, though, we didn’t think to tell you not to share our story, and it’s amazing the amount of support we’re seeing. I know it’s become a cliche, but we cannot express how much we appreciate your support. The only bad thing about being supported in a difficult situation is that you have to face that situation. I had completely forgotten about the picture of Alex just before we had to say goodbye to him. This is Alex just before we had to give him away. I can’t remember exactly, but I believe this image was taken just a week or so before placement by my sister. My family came up to visit us and help us through what has easily been the toughest thing we ever had to do: remove Alex from our home. 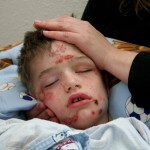 The picture was taken of Alex when he was medically sedated. That’s a fancy way of saying the ER didn’t know how else to deal with his rage, so they pumped in a bunch of Ativan and Haldol until he slept. Maybe it’s just because I had forgotten about it, but to me this is a more powerful picture than anything else I have. It’s our sweet little boy just lying there calmly, the battle with himself evident on his torn-up face. He’s an angel, resting finally after a long struggle with something none of us can fully understand. He’s at peace. It wasn’t much longer before we took him to a foster home where he stayed about a week before being placed in the state crisis center. I remember the ride. He was given the last of our hash, and he was so happy to be in the car on a long ride. I felt awful. We were, in my mind, abandoning him. Everything changed in those precious few moments, and this picture is just a reminder of our beloved son just before we made the most painful change we had ever done. Neither his mother nor myself can look at the picture without an overwhelming feeling of sadness and despair. This is an image that means so much to us — one of the last memories of Alex in our everyday life. In our home. Alex is doing pretty well, he really is, but this reminder of what we’ve lost still hits us as hard as ever. Some days I wake up for work and have to remind myself that while the job itself doesn’t really matter, the pay and benefits do. Alex has good health insurance so long as I get out of bed and do my job. I can afford to spend money on gas to visit Alex — if I stop wallowing in self-pity and get to work. Some days are still a struggle for my wife and myself. Even though we didn’t mean for support to come our way today, it’s a good reminder that we’re working to help Alex, and at the end of the day, that’s a good thing to have done. Hello, I am Janet’s sister in law and saw Alex on facebook. I am so sorry that you and Alex are going through this. I wanted you to know that we will be praying for you and your family. I may have jumped the gun in my recent comment to your March 24th post without first reading this most recent one…Alex may no longer be in a facility/home where you can administer the cannabis to help him. My apologies, and regrets, if that’s the case. Forcing a child to live this way by denying him the benefits of a natural plant speaks volumes about human ignorance. Cannabis clearly lacks the severe and potentially fatal side effects that the powerful pharmaceuticals he receives. The well-educated know that the FDA’s approval of a drug by no means equates to safety, and by all means it usually equates to an endless list of severe side effects, some life-threatening for adults & even more for children. You should not have to have this battle and the fact that you are at this point is mind boggling. You should be allowed to administer whatever is necessary to improve his state, and the law should not have the jurisdiction to get in the way given his severe medical circumstances. I feel tremendous sorrow for your precious little boy, and I am filled with disgust for those deliberately standing in your way to give him a better quality of life. He doesn’t have to suffer this badly, yet certain members of our society are making him suffer to protect their own personal beliefs and opinions. They have no place nor right to decide for you how to best take care of your son given his profound condition. They show more compassion and humanity to stray animals, declaring them helpless. Your son is helpless, he is suffering, and they show no compassion or humanity to him by denying the one thing that has been proven to help him right now. Shame on them, they are ignorant, controlling, and barbaric; shame on them all. Your son is severely injuring himself, and society is adding insult to his injuries by denying him a proven remedy with low side-effects. Society is failing Alex in the worst way right now, and I for that I am so sorry. But I will also pray for those criticizing you because they really need it, I will pray for those who protect their right to force their personal beliefs & opinions on others even at the expense of a severely suffering child, I will pray for those who choose to place their own righteousness ahead of a child’s most dire needs, I will pray for these individuals denying him a chance to smile, and I will pray for those charged with making the obvious exception to the rule so that your son can regain some normalcy & happiness in his young life. Their kids are healthy and happy, the least they could do is give yours some happiness and a little peace. Thanks for your support (both of you). It’s been a long road, but we may have some help on the way. I can’t really get into detail yet, but our fingers are crossed. Next Next post: “The event” is done.